UP Jal Nigam Joining Letter 2019 In this SSCBANKGK Episode you will check the UP Jal Nigam JE Joining Letter also called Junior Engineer Appointment Date. If you wanted to work in Uttar Pradesh Jal Vibhag in Gramin and Sahri (City Department) than you must check update of Uttar Pradesh Top Jobs, Result Admit Card and Other day to day activities website called as SSCBANKGK.IN. Jal Nigam Department Recentely in news for selection process in Junior Engineer because many candidates who have given exam of UP Jal Nigam JE 3000 Recruitment 2019 they wants joining letter on previous vacancies. More details you may find below article of UP Water Department Vacancy 2018. UP Jal Nigam JE Joining Letter 2018: Allahabad High Court has given decision on Junior Engineer exam giver to give them relaxation on Niyukti Patra (Joining Letter). 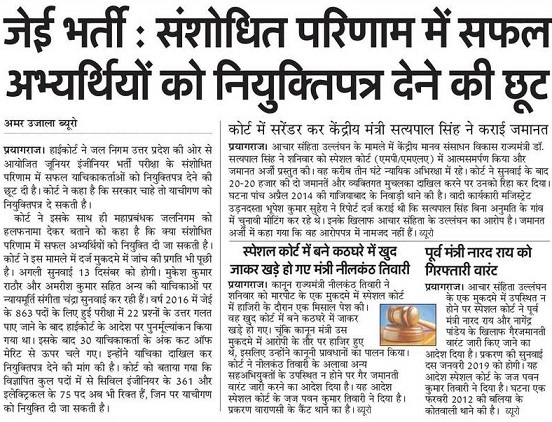 Court has said Yachigarn can ask UPJN or Current Governtment to give them joining letter of Junior Engineer. So you will soon check the notification of UP Jal Nigam Joining Date 2018. UP Jal Nigam JE Merit List 2018: In Court case of Jal Nigam JE Bharti Allahabad court ask govt to give Halafnama of Sanshodhit Result of selected candidates who are eligible to get joining letter of Jal Niagm JE. Total Number of vacancies: 863 posts. 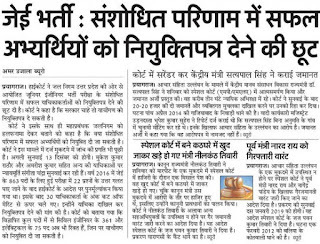 Answer Key: Due to 22 wrong question high court has made rule to reevaluate answer key of Jal Nigam je 863 posts. UP Jal Nigam Junior Engineer Upcoming Vacancy in 2019: Through advertisment and backlog vacancies still 361 civil engineer and electrical 75 posts is vacant.